On the second day of 2016, I have gathered with Federated Indians of Graton Rancheria tribal councilmembers Lorelle Ross and Gene Buvelot to observe the southern view from the eastern ridge of Sonoma Mountain, about seven miles east of Petaluma. From this world-at-your-feet platform, the smooth blue expanse of San Pablo Bay rises against San Francisco's Financial District, with Mt. Diablo and Mt. Tamalpais visible on the water's fringes. The main object of these indigenous leaders' attention, however, is a far smaller body of water that historically occupied a 200-acre depression directly beneath the ridge. For thousands of years, this shallow lake, today known as Tolay, was a sacred gathering place for Coast Miwok people—including the ancestors of Ross and Buvelot. The lake had been, as Graton Rancheria shairman Greg Sarris informed me, a Miwok version of Stanford Medical Center: a place of extraordinary healing power that called together indigenous people from throughout the region now known as the western United States. In the late 1880s, however, an industrious farmer dynamited the southern berm that held back the lake's water, draining it to San Pablo Bay. The land became gridded and platted with ranches, cutting off the indigenous people's access to it. This was one in a long line of deadly and devastating insults against the Miwok. When the Spanish arrived in the late 18th century, they introduced population-destroying diseases and incarcerated Coast Miwok and other California natives in crowded, disease-ridden labor camps at missions in Petaluma, San Rafael and Sonoma. The Graton Rancheria's membership, which includes descendants of the Coast Miwok and Southern Pomo linguistic groups, trace their ancestry to only 14 known survivors of Spanish and U.S. colonization. Their combined pre-contact population had been 20,000–30,000. These cultures' stubborn endurance, however, ensured that their connection with sacred places was not fully severed. 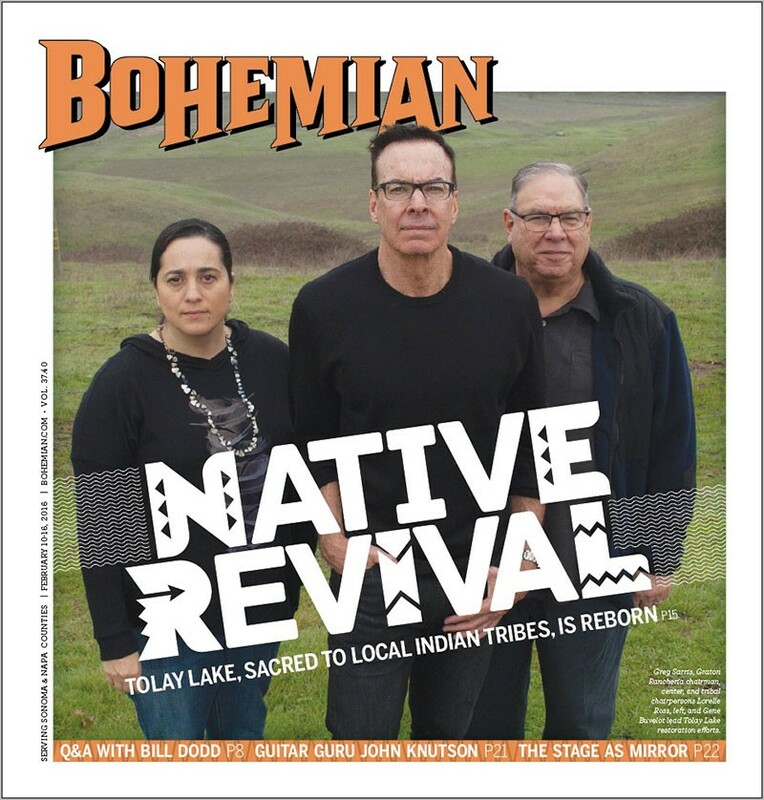 Shortly after the Sonoma County Regional Parks department purchased 1,900 acres that includes Tolay Lake in 2005, the Graton Rancheria tribal council saw an opportunity—and took it. The councilmembers borrowed $500,000 against their future casino and donated it to the county to support the park. In turn, they gained an influential role in determining everything from trail locations to the restoration techniques the county parks department will rely on to restore the area's streams and vegetation, and the lake itself. For the Graton Rancheria Indians, the healing place of their ancestors has become an important communal gathering area, and a focal point of healing in an altogether more modern sense. "If you don't have a connection with the land, you're lost," says Ross, who has been a tribal councilmember since 1996, when she was 19 years old. "Now we have kids in our tribe who are growing up experiencing revitalization and re-engagement with this place their ancestors took care of." They are not alone. Throughout the North Bay, the North Coast and multiple other regions of California, indigenous people are reclaiming stewardship of ancestral territories from which they were once violently evicted. The struggle of the Federated Indians of Graton Rancheria, as with any sovereign entity, has been defined by access to land. A major turning point occurred in 1851–52, when treaty commissioners, sanctioned by Congress, negotiated 18 agreements setting aside roughly 7.5 million acres of California territory as reservations for 500 indigenous nations whose ancestral land base was being overrun by gold miners and land speculators. But the Senate rejected the treaties and ultimately sealed them. The documents were unsealed more than 50 years later. Amid the resulting public outcry, Congress provided a very modest form of redress, passing legislation authorizing the purchase of small tracts of land called "rancherias" on behalf of "the homeless Indians of California." In the case of the Graton Rancheria Indians, a 15.5-acre rancheria northwest of Sebastopol was set aside for "the homeless Indians of Tomales Bay, Bodega Bay, Sebastopol, and the vicinities thereof." Before long, even this small vestige of the Graton Indians' aboriginal territory was stripped away. In 1958, Congress revoked Graton's federal recognition (and that of 39 other California tribes), auctioned most of the rancheria land and turned the residents out of their homes—part of a larger push to "terminate" Indian reservations and thereby hasten the people's assimilation into the dominant U.S. society. "We became like the white man: homeless in our own homeland," Sarris, the Graton Rancheria chairman, explains. Sarris is a man with an impressive résumé. He is a longtime college professor, author, Hollywood producer and screenwriter. He played a key role in his tribe's restoration to federal status. In 2000, President Bill Clinton signed into law the Graton Rancheria Restoration Act, which Sarris co-authored. Formerly an English professor at UCLA, he is now the endowed chair of Writing and Native American Studies at Sonoma State University—a position funded by the Graton Rancheria itself. That endowment, as with other tribal line items, is largely made possible by the Graton Resort and Casino, an $800 million monolith in Rohnert Park, on the west side of Highway 101, that opened in 2013. Though the casino originally faced an intense backlash from a segment of the local populace, it has earned support from many critics as the tribe's intentions have become better known. The tribal council agreed to donate $12 million and $9 million in annual revenue, respectively, to Rohnert Park and Sonoma County to offset its impact on public services. Along with federal grants, the casino underwrites many social services for tribal members, including housing assistance, healthcare, nutrition and health counseling, a cultural resources library, a language preservation program, and more. Sarris says that, in contrast to the hospitality and wine industries, which he says generally exploit their workers, the casino was built and is operated by union employees who earn above living-wage rates. His tribe is also investing in ecologically minded farms that will employ undocumented people and, pending permission from the county, low-risk prisoners at living wages. Amid this larger social justice agenda, the tribe is working to pick up the pieces of a shattered history—a history fundamentally tied to the landscape. Sarris notes that his people's entire historical land base, including places like Tolay and the Laguna de Santa Rosa, are akin to their holy text. "Most of the Bible, if you want to use that analogy, has been destroyed—has been burned," he says. "All we have are shards of the text, bits and pieces of it. Tolay Lake is a place where we can make a start." Currently, the park is only open for special events. It will likely open to the public in 2017.